The He 178 was the world’s first turbojet aircraft to fly on August 27, 1939. The test pilot was Flight-Captain Erich Warsitz who also flew the first rocket powered plane, the He 176.1 The aircraft was designed by Ernst Heinkel after Hans Joachim Pabst von Ohain approached him with his own design and prototype centrifugal-flow engine. Heinkel like the idea and agreed to fund the project. The first engine developed by the Heinkel Flugzeugwerke was the HeS 1. The engine showed promise and further development led to the HeS 3 and this became the engine that would power He 178. Although the first flight was successful, it was not accepted by the German Ministry of Aviation (Reichsluftfahrtministerium or RLM) after a demonstration flight on November 1, 1939, to Ernst Udet, Erhard Milch and engineer Helmut Schelp. The aircraft achieved speeds to 598 km/h (380 mph), but combat endurance was only 10 minutes. Udet, Milch and Schelp were unimpressed and saw no practical value for the airplane. • The war was on. • It was not a military aircraft. • It had no weapons. However, what Heinkel did not realize was that the Reich Air Ministry was developing its own jet engines. In 1939, BMW was building its 003 and Junkers was working on its Jumo 004 turbojet engines. These were axial-flow turbojets and not centrifugal-flow turbojets. The idea for the axial-flow turbojet had been around for awhile and was patented by French engineer Guillaume in 1921.3 Axial-flow turbojets promised much higher flight speeds unlike centrifugal-flow turbojets being developed at Heinkel and by Frank Whittle in England. The axial-flow turbojet was a more promising engine demonstrating excellent performance with approximately 78% efficiency. With straight-flow air and a smaller cross-section, these features proved to be important for a high-speed aircraft design. 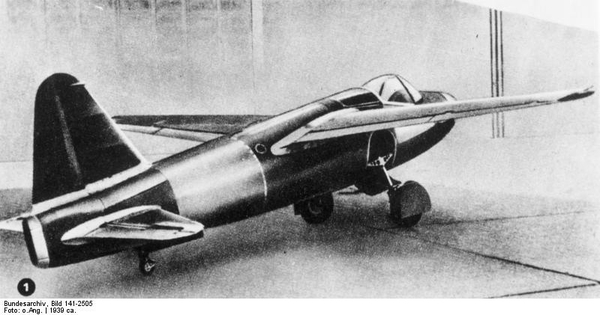 Despite the decision of the RLM to not fund the He 178, Heinkel went on to develop the first turbo-jet fighter, the He 280 which preceeded the Messerschmitt Me 262. Near the end of the war, Heinkel was finally allowed to fulfill his dream and construct his own jet fighter, the He 162. 1. Cajus Bekker. The Luftwaffe War Diaries. New York: Ballantine Books, Inc., 1972. 484. 2. Michael Pavelec. The Jet Race and the Second World War. London: Praeger Security International, 2007. 23. ©Larry Dwyer. The Aviation History On-Line Museum. All rights reserved. Created November 22, 2012. Updated October 22, 2013.